Multiple Sclerosis is thought to be an auto-immune disorder in which the immune system attacks the myelin sheath that surrounds axons within the brain. Myelin is a phospholipids that insulates axons and allows for quicker conduction of action potentials, or nerve impulses, which cause the brain to communicate with the rest of the body in order to produce a function. Without myelin, these action potentials cannot be conducted properly, and even the simplest of functions fail. The symptoms are widespread throughout the body including involuntary eye twitches, difficulty with coordination, speech problems, unstable mood, and chronic pain. While multiple sclerosis is not considered a genetically heritable disease, there may be a genetic disposition which makes a person more susceptible to developing the disease. Currently there is no cure. 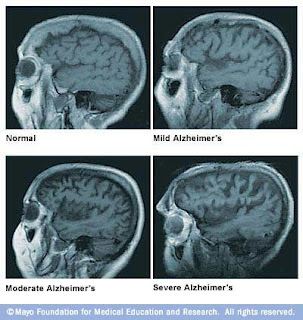 Alzheimer’s disease is a degenerative form of dementia. It is caused by a mis-folding of an amyloid protein resulting in a build-up of plaques throughout the brain. Additionally, there is a major loss of neurons (which produce action potentials) and atrophy within the frontal portion of the brain. While the exact cause of the disease is unknown, there are many hypotheses as to what bring about the onset of Alzheimer’s, including a reduction in the synthesis of the neurotransmitter acetylcholine, which is essential for the proper conduction of action potentials. Researchers are also investigating the possibility that the amyloid protein plaques are at the root of the disease. Symptoms of Alzheimer’s include confusion, mood swings, long-term memory loss, and a general withdrawal from society. While there are currently three drugs approved for Alzheimer’s treatment, none of them show a drastic reduction in the symptoms or a slowing in the progression of the disease. 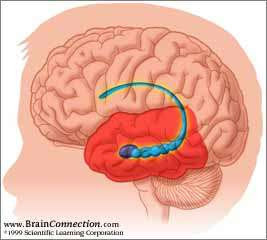 Parkinson’s disease is a degenerative disease of the central nervous system caused by decreased production of dopamine. 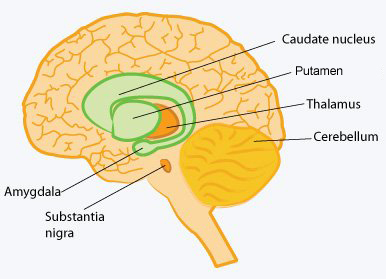 Dopamine is a prominent neurotransmitter involved in motor control which is centered in the basal ganglia within the motor cortex. The major symptoms of the disease are rigidity, inability to retain proper posture, and the characteristic tremors known as Parkinsonism. In addition to the well known symptoms, patients suffer from insomnia, dementia, slowed reaction time, degradation of visual function, and unintelligible speech. The majority of Parkinson’s cases have no known cause; however, some genetic connections have been made, as well as cases caused by toxins and head trauma. There is currently no known cure. Major depressive disorder, also known as clinical depression, is a disease that has been classified as both psycho- and physiological. While the disease varies widely throughout society, the common major cause is reduced levels of serotonin and norepinephrine, which are neurotransmitters within the brain that regulate synaptic communication. 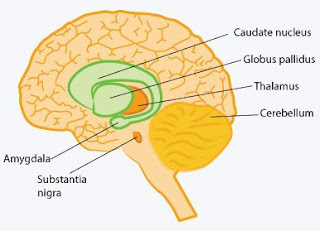 Additionally, clinical depression may be connected to degeneration of neurons within the hippocampus, an area of the brain responsible for mood. However, there are also thought to be psychological causes for depression such as low self-esteem and a self-defeating attitude. Symptoms by which depression is diagnosed are an overall feeling of helplessness, weight-loss, anxiety, and fatigue. Currently, there are many varieties of anti-depressant medications that curb the effects of the disease, as well as psychotherapy. However, there is no true cure.